I am a citizen who believes in peace. Peace that silences the guns, puts food on the table, allows the poorest child to go to school, provides jobs, gives every woman, indigenous person, elderly, individual with disability a voice and a chance to build and realize her/his dreams. I am a citizen who takes pride in Mindanao. I am a citizen who honors a rich history in the struggle for Change. After 40 years of war and human suffering, and 17 years of negotiating to end the armed conflict in Mindanao – I now understand, respect and embrace what self-determination for the Bangsamoro people means. I am a citizen who supports the Bangsamoro Peace Process. I celebrate and affirm my vigorous support for the final agreement that has just been sealed. So that finally, communities shackled by war can rise up from the years of trauma and abject poverty. But the deed is not yet totally done. The pursuit for peace is a continuing project. I am a citizen who fully commits to a just and peaceful future for Mindanao and the Philippines. I pledge support to a peace process that “listens”; where all voices are heard, respected and considered; where no one will be left behind. 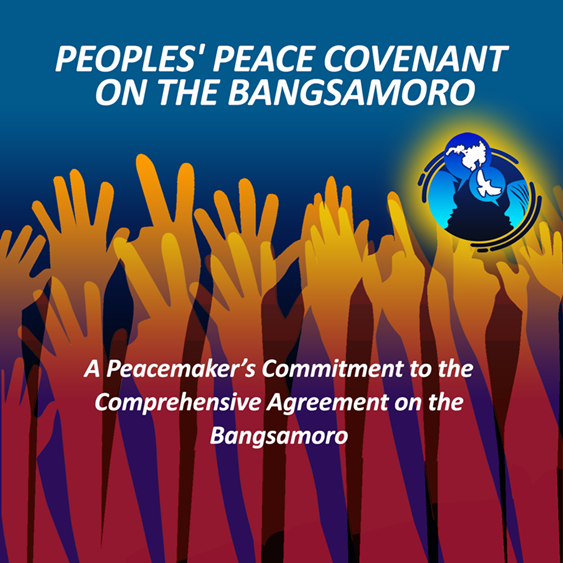 To continue to guard the gains we have achieved and to remain resolutely vigilant that the implementation of the Comprehensive Agreement on the Bangsamoro (CAB) realizes the aspirations and rights of the poorest of the Bangsamoro citizenry and other diverse peoples of the region– the indigenous peoples, migrant Christians, and other social groupings. And finally, I take this oath as a believer of Change. Give peace a chance for change to happen in the Bangsamoro and beyond. Salam, Kalinaw, Paghidaet, Kapayapaan, Peace!! Interreligious Solidarity Movement for Peace – Zambo.